Big Walnut’s Grace Bodker (3) defends Indian Hill’s Ellie Podojil during the first half of Tuesday’s Division II state semifinal in Xenia. XENIA – Senior Anna Podojil was poised to get a goal all night. So, when she deflected a clearing attempt by the goalie and scored into an empty net for the go-ahead goal late in the second half – it seemed fitting. 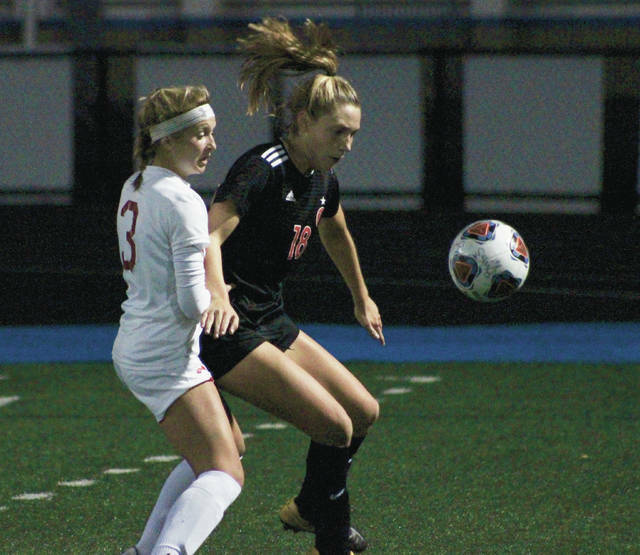 She scored the go-ahead goal with 11:25 remaining to send Indian Hill to its second trip to the Division II girls soccer state championship in as many years with a win over Big Walnut – this time by a 2-1 margin Tuesday night (Nov. 6) at Xenia’s Doug Adams Stadium. The ball was fed back to the goalie and Podojil was able to step in front of the clearing attempt and knock it back. She took her shot from the far-left side and snuck it just inside on the right side of the goal for the game-winner. It was the first time the Golden Eagles (14-3-4) gave up more than one goal in a game since the season-opener at New Albany. It took all of 40 seconds for Indian Hill to score all the goals it would need to defeat Big Walnut in last year’s state semifinal. This time, the Golden Eagles let one in off a corner kick midway through the first half. But they responded a little more than two minutes later with the equalizer. Indian Hill’s Podojil gave the Eagle defense fits in the early-going – most notably in the ninth minute. Podojil ended up with the ball near midfield after a Grace Bodker corner was cleared by the Indian Hill defense. She sailed through the open field on the right side before sending a low shot that BW goalkeeper Payton Carter went to her knees to stop. Indian Hill (17-2-3) kept the pressure on – breaking through when Claire deHamel slid one to the top of the box where Wirthin was there to send it into the back of the net with 21:34 left in the first half for a 1-0 lead. Unlike last time, the Eagles had a response … and it was immediate. Alyssa Tarney was fouled trying to get clear for a shot in front of the goal and Grace Bodker sent the ensuing penalty kick to the right corner of the net to tie it 1-1 with 19:29 remaining in the half. Podojil was fed through by Meghan O’Brien in the 41st minute, but her shot was stopped by Carter from point-blank range. O’Brien tried to follow with the rebound, but her shot – that would have given Indian Hill the lead – missed wide left. Podojil had a second shot stopped by Carter from close range in the 62nd minute. Cincinnati Indian Hill faced Bay Village Bay at MAPFRE Stadium in Columbus Friday (Nov. 9) and won 1-0 to win the Division II state championship for the second year in a row.